One of the most repeated mantras in gardening is “right plant, right place.” Like other garden sayings, there is a lot of truth in the advice to choose plants that fit the conditions of a landscape rather than try to adjust the location’s soil, sunlight or micro-climate to fit a desired plant. 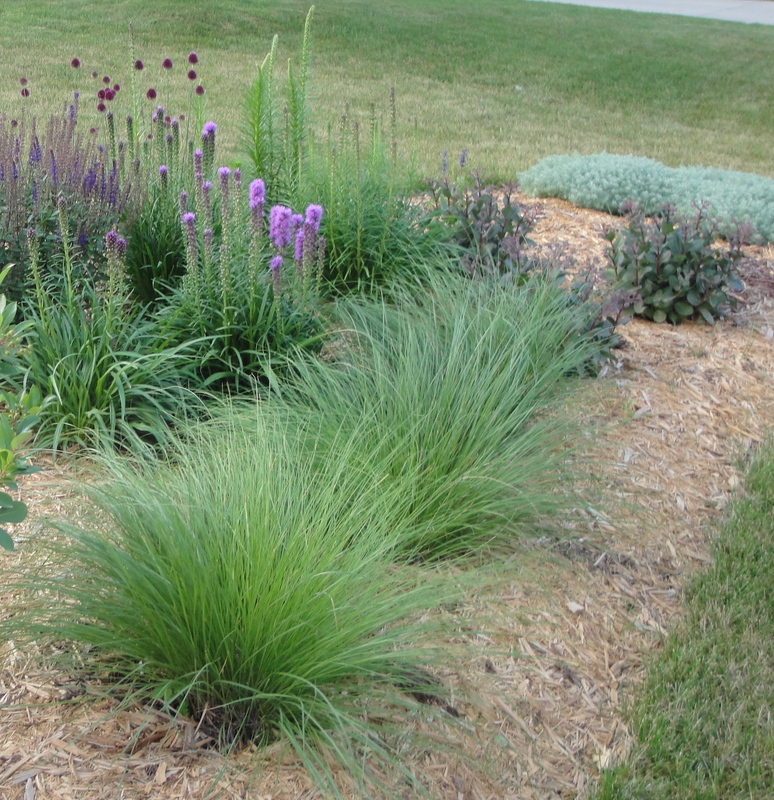 These plants are in the right place–a baking hot bed near the sidewalk. They thrive there because it’s the kind of environment they can accommodate. Three years ago, I gave up on growing grass in the southeast corner of my lot. We don’t have an irrigation system and don’t want to install one. The corner gets baking sun much of the year. It’s on a slope, so water runs off quickly. Grass likes wet and cool; this spot had hot and dry. So, out with the grass, and in with a planting bed with prairie plants: grasses, blazing star, Russian sage, perennial salvia, sedum. Now in its third season, I love looking at this colorful bed almost as much as I hated looking at the dry, dead grass that used to be there. And, it’s significantly less work than mowing and watering the area used to be. Each spring, I clean up the area, removing spent plants and stray stems. I usually refresh the mulch and maybe edge it. After that, I just pull weeds, if I see them. In fall, I cut down a few of the perennials and leave the rest for winter interest. That’s the entire maintenance plan. These alliums add color to the bed and are a bee magnet. I’ve only had to replace one plant—a chokeberry bush that didn’t make it through the first winter. Everything else is big, beautiful and soaking up the sun and heat. 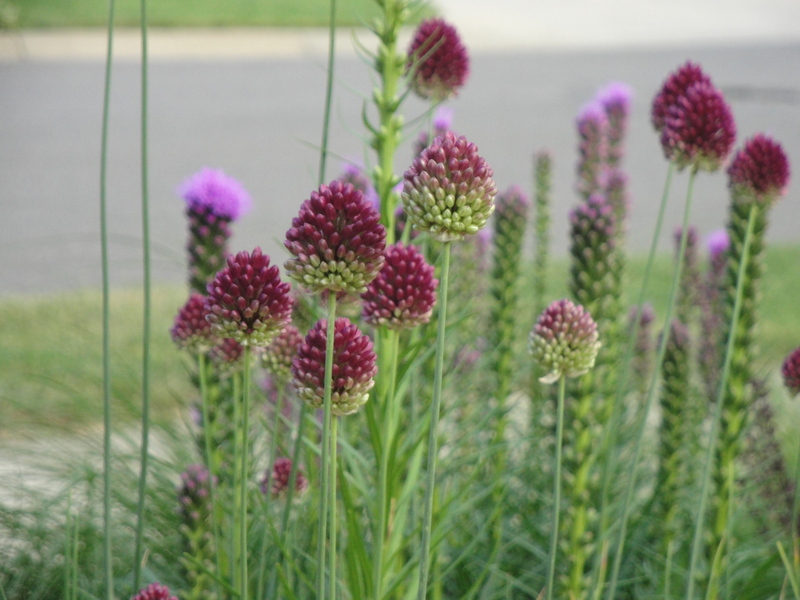 Last year, I added these allium because their purple bulbs complement the colors of the ‘Kobold’ blazing star and salvia so nicely. Right plant, right place. Good advice. « Slime Mold Attacks! Blame Heat Wave! That is great advice, and some I should heed. All too often I get wrapped up in trying to make a plant survive where it doesn’t want to, and this is just plain silly! I also enjoyed the slime mold post (no, I don’t mean I like slime mold, lol) I’m just glad to hear what it is. Scary-looking, isn’t it?